The subject of this blog is dear to my heart, since one of my family members has just been diagnosed with Cancer. As the instances of Cancer continue to escalate, most people are challenged in one way or another by terminal illnesses either by their own afflictions or those of people close to them. I feel it is important to shed light on this important subject. And if we are going to explore this, it is also important to address the causes of terminal disease, and the whole subject of health, both physical and mental. Osho created a groundbreaking book called From Medication to Meditation . With that title, he has put in a nutshell the direction necessary for health and a sense of wholeness. I have been studying health, healing, nutrition and meditation for the past 38 years, with myself as the lab. Since 1990 I have been offering healing sessions to people from around the world. During this journey, I have gathered many jewels on the subject, which can be of great benefit to people who are ready to receive them. This blog may answer some of the questions you carry around this subject and if you want to look into it in more depth, you can come to the Health, Nutrition and Meditation Retreat . I will be teaching with Niten from 22-24 July at the beautiful Flore Retreat Centre, about an hour from London. Recently I gave a session to a really charming young man who has been suffering from Crones disease for the past 10 years. He was forced to wear a bag outside his body to dispose of his faeces. I asked him if the doctor had spoken to him at all about nutrition, and he said “No, he just told me to eat whatever I want.” I breathed a deep sigh, and asked him to tell me what his typical diet was. He told me he has too much pain to eat breakfast, and therefore only eats lunch and dinner. His lunch consisted of a packet of crisps and some coke. Later, if he got hungry, he would eat a burger, chips and coke or some lamb stew. I asked him if he ever ate vegetables and he said he had never eaten vegetables in his life. I asked him if he ever drank water, and he said occasionally, but mostly just soda pop. We can compare this typical westernised diet to what our primate brothers and sisters, the chimpanzees, eat in the wild; a diet of 80% fresh greens, complemented with fruits, seeds, berries, nuts and a few grubs. On another occasion, a man called me in desperation because he was suffering from extreme dizziness and the doctor had told him he had to get immediate surgery in his inner ear. I asked him if he was drinking. He replied, yes of course, I drink all day long. I asked him what he was drinking. He said he was drinking about 8—10 cups of black tea. I asked him if he was drinking fresh water. He said, no, never. I told him that black tea is dehydrating, and that water is essential for life. The ear is connected to the kidneys, and so the sense of dizziness is a sign of extreme dehydration. One can only wonder what in the world is being taught in medical schools. It appears that the vital subject of nutrition is being overlooked for some bizarre reason. Perhaps the study of corpses doesn’t inspire the need to study nutrition and emotional well being of living persons as a foundation for good health! In my years of experience, I have seen that in most cases, the causes of ill health are related to food choices, lack of exercise, environmental toxins, and unresolved emotional issues. Since sane nutritional advice and emotional healing is not offered in mainstream society, it is of great importance that each individual takes responsibility to become their own health detective, doing research, reading books, asking questions, and basically taking the reins in their hands for their own wellness. A prominent holistic healer, Dr. Richard Schulze explains his fascinating ‘miracle cure’ in his book, Common Sense Health and Healing . Both his parents died while he was in his teens of heart failure. He was told by doctors, at the age of 17, that it was genetic and that he also had the same disease and would need to receive heart surgery urgently if he was to survive. He was in the hospital waiting for his turn to receive the surgery. Ahead of him in the queue was a man who had the same type of heart disease as Richard. The man died on the operating table. Richard decided to take on the challenge of saving his own life, and escaped from the hospital. He went to a naturopathic doctor and was told to go into his kitchen and throw away anything which was coming from animal sources, i.e. milk, butter, cheese, meat, etc, and to buy a juicer and make vegetable juice. He describes his awakening process as he cleaned out his kitchen and realised he had to throw every single bit of food in it because it was all coming from animal sources. He had been living his entire life on meat, cheese and potatoes. After three months of being on a vegan diet and drinking a lot of raw juices, he went back to the doctor for a check up. His, ‘genetic heart disease’ was cured. He went on to become a very outspoken expert on how to save your own life through nutrition. If you wish to understand more about the vegan way of life, I highly recommend a book called The China Study by a leading light in the field of nutrition, Dr. T. Colin Campbell. In his book, he emphasizes the fact that the leading cause of western diseases, i.e., cancer, diabetes, heart disease, obesity, are all linked directly to the nutritional choices we make. Drink 6—8 glasses of fresh living water in between meals. If water has been boiled it does not hydrate the cells. Avoid all refined sugar and also chemical ‘diet’ sweeteners like the plague. Use instead: stevia, rice syrup, organic maple syrup, date syrup, apples, raisins or organic honey. In other words, you can still enjoy sweet tastes without the deadly consequences of sugar. Avoid MSG and treat any E numbers on packaging with great suspicion. In fact, it is better to avoid packaged ready-made foods unless you know it is fresh and organic. Eat organic. Support organic farms by ordering food from them. Eat minimum 50% raw vegetables as your dietary mainstay. 80% raw food is great which would include fruits, vegetables, nuts, seeds and berries. If you feel this is not possible for you then try a macrobiotic diet or an Ayurvedic diet. Use super-foods, as outlined in Niten’s blog . Avoid micro-waved food and also radiated foods. Avoid animal protein of all kinds, and if you feel it is important to eat animal protein use it like a condiment rather than a main dish. “Cancer is the leading cause of death in economically developed countries and the second leading cause of death in developing countries. The burden of cancer is increasing in economically developing countries as a result of population aging and growth as well as, increasingly, an adoption of cancer-associated lifestyle choices including smoking, physical inactivity, and westernised diets.” – A Cancer Journal for Clinicians. If you or someone you know has a life threatening disease, below are some helpful tips of tried and tested ways to cure such diseases. A deep inner question needs to be asked, Do you want to live or die? If the answer is “to live’ then you will need to become a detective for your own healing. Those who survive terminal illness are the ones who question the doctors, who have a strong will to live and are very sharp and intelligent about the research they do, what they agree to do or do not agree to do. Basically, they design their own healing protocol and are the ones in charge of all aspects of their own healing. Phyto Plankton, is what whales eat. They live to be 150 years old. A man is producing it after he cured his own cancer with it. His cancer was spread over his whole body. He was raising fish, and was attracted to the phytoplankton he fed them, intuitively reaching out and eating it by the handful. His cancer disappeared. Flor-Essence is a collection of herbs, used by Canadian Indians as a cancer cure, has been researched for the past 70 years and found to be very effective. Available in health food shops. Tachyonized Ultra Prozyme is a very effective immune system enhancer. The immune system becomes so strong that life threatening disease cannot overpower the body. Mistletoe therapy . This is injected directly into the tumour and acts as a sort of natural chemo-therapy. It creates strong fever and the tumour shrinks. My friend just cured herself of cancer in this way. This treatment was developed by Rudolph Steiner. It is also important to drink fresh juice, particularly green juice or green smoothies, with superfood greens in it, such as spirulina and blue green algae. Inner psyche and emotional work is also very helpful, such as The Journey by Brandon Bays or The Healing Journey or past life regression such as is offered in Colour Light Therapy sessions. Breath and emotional release work of all kinds is important. It perhaps goes without saying that it is necessary to stop doing what has caused the body to go into overwhelm to the point that it creates life-threatening illness. In Tantra, we regard the body as a temple. Both the body and our surroundings are important as a mirror of our soul. Osho says, “The body is the soul made visible.” In this sense, de-cluttering the home, and also the body is very important. Regular cleansing of the internal organs is a great way to glide into good health. I recommend Blessed Herbs as an easy and efficient cleanse. Another aspect, which is often overlooked in regards to health and longevity is the importance of meditation. To understand this, it is helpful to imagine your car. It is, of course, important to put the right fuel in your car, and also to take it for regular servicing if you wish it to be in good condition. Healthy eating is the fuel. Servicing is meditation. When we meditate, we are allowing ourselves to be plugged into source and recharged. To learn this art, it is important to receive a transmission from someone who has experience in meditation. The mind and emotions can be a mine-field of confusion and therefore, we need to receive initiation into streamlined ways to explore our inner universe. Each person is unique, and so what works for one may not work for another. Experimentation, awareness, and a loving attitude are needed to embark on this path. When we meditate, and when we practise Tantra, we discover that Love is omnipresent in the universe. From the smallest particle of matter to the biggest star, it is love that empowers all of life. When our body, mind, emotions and soul are all in harmony with love, wholeness is the result. This state of harmony is then reflected in ourselves and in the world around us. What Your Doctor May Not Tell You About Menopause by John R Lee, M.D. 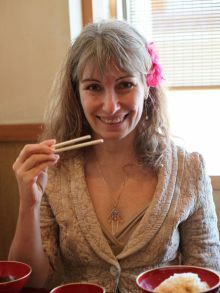 The Okinawa Way: How to Improve Your Health and Longevity Dramatically by Bradley Willcox, M.D. / Craig Willcox PhD and Makato Suzuki, M.D. Tachyon Energy, A New Paradigm in Holistic Healing by David Wagner and Gabriel Cousens, M.D. Thank you Sarita! I love you and the beautiful wisdom you share with us.. Thank you for this great article! It has been very useful. I hope that you will continue sharing your wisdom with us. Thank you for sharing this Sarita. When one of my closest friends was diagnosed with cancer a few years ago she determined to heal herself naturally – which she did! I spent a lot of time researching cancer and therapies to support her. I was amazed to discover some well-documented but little known facts such as -we all have cancer cells in our body – it’s just that the immune system keeps them in check. So it’s not rocket science to deduce that when the immune system is stressed through life-style, poor diet, environmental pollution etc that this is when its protective function is undermined and disease can manifest. Equally obvious is the solution – support your immune system by improving your life-style, diet and doing your best to detox your environment.